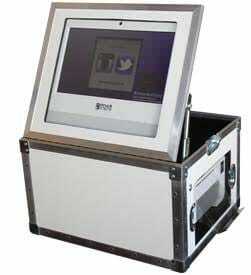 Measuring 20” wide and 17” deep, The Cube utilizes hashtag technology to take your event to the next level! You will be able to connect your social media accounts to gather and print photos taken by your guests on multiple social media platforms during your event. You will also be able to automatically “like” all photos using your hashtag! The Cube can be booked on it’s own or as an add-on to our Photo Booth service. Wow. Best DJ service ever! In the early stages of wedding planning, my groom and I knew we needed to have a good DJ at our wedding – because having good music is so key to ensuring that your guests have a good time. We had attended a wedding several months earlier, and the bride and groom had hired the best DJ I had ever seen. I had never been to a wedding before where the music was so good, no one ever wanted to take a break from the dancing! I asked the bride who her DJ was, and she told me they hired Nick from Fantasy Sound. She had nothing but great things to say about Nick and Fantasy Sound. So naturally, I called Fantasy Sound to hire Nick to do our wedding. Unfortunately, Nick was not available for our wedding date. We were disappointed, but Fantasy Sound had another DJ who was available for our date –DJ Marshall. Wow! I am so glad we hired him, because he was just as awesome as Nick. (I have reason to believe all of their DJ’s are probably spectacular). The process we went through with Fantasy Sound was so professional, enjoyable, and seamless. Their experience in the industry speaks volumes. I had two meetings with them before our wedding, and we went over everything. There were so many things that I did not even think of, that they were so well prepared for. They went through every song choice with us, from the pre-ceremony music, to the very last song. I cannot tell you how valuable this attention to detail is. Our wedding guests danced all night, and had so much fun! I had so many guests tell me they did not want to take any breaks from dancing, because the music was so good…just what I wanted (and had remembered from the other wedding). Marshall was the perfect DJ! We could not have imagined anything better!